(Verso) center, in black ballpoint: "Ed Ruscha 1962"
(Verso) center, in pencil: "STANDARD - FIGUEROA ST./ LOS ANGELES" lower right, in pencil: "NOT IN BOOK" lower left, in pencil: "PH.62.43 - B MATTE (was .10.B)"
Rejecting the tradition of the limited-edition, handcrafted artist's book, Ed Ruscha produced sixteen photo books between 1963 and 1978 in large editions on high-speed professional presses. Most feature snapshot-like photographs that he made with his 2 1/4-inch-format Yashica camera and sequenced in straightforward layouts. 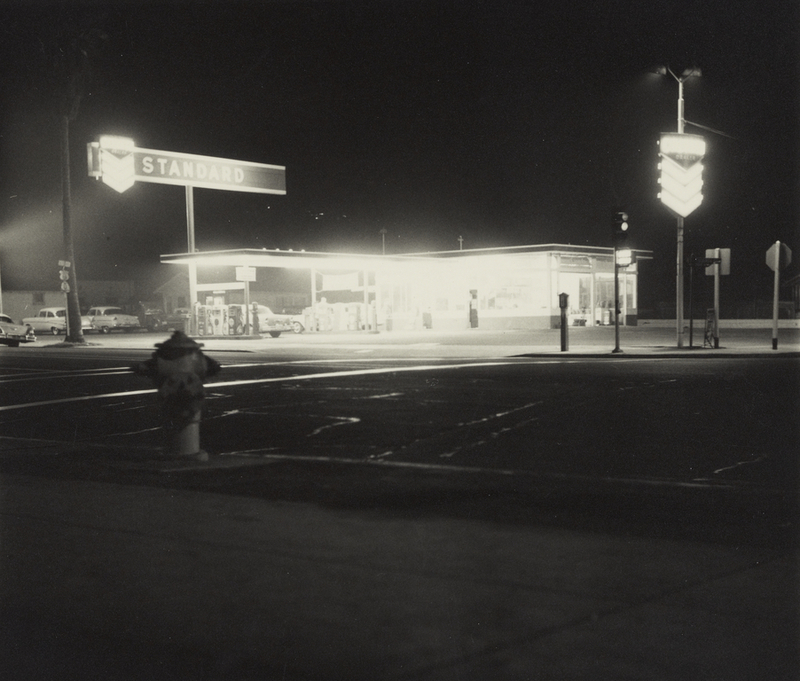 For Twentysix Gasoline Stations (1963), the first of these photo books, Ruscha photographed gas stations along Route 66 during road trips between Los Angeles and his hometown of Oklahoma City. Several of the photographs became source material for works of art that he would realize in other media either at the same time or several years, even decades, later. Although made in conjunction with this project, this photograph was not included in the book. Wolf, Sylvia. Ed Ruscha and Photography (New York: Whitney Museum of American Art, 2004), p. 1. Rowell, Margit. Ed Ruscha: Photographer (New York: Whitney Museum of American Art and Gottingen: Steidl, 2006), p. 13. Poivert, Michel. Peintres Photographes: de Degas à Hockney (Paris, Citadelles & Mazenod, 2017), Plate 117, p.150.